Before 2012, the only traveling my family did for Thanksgiving was over the river and down the freeway to Grandma's house - twenty minutes away. But then my parents retired to Arizona, and my father made it clear that if we wanted to see them for the holiday, we'd have to go to Phoenix. Which isn't exactly terrible - compared to rainy and cold in Seattle, sunny and 80 degrees is pretty nice. As I searched for tickets, I found that the cheapest alternative was to fly out Thanksgiving afternoon. We all agreed that we could celebrate the holiday on Friday. I was very apprehensive that traveling on Thursday was going to be a nightmare, but it was actually quite pleasant. 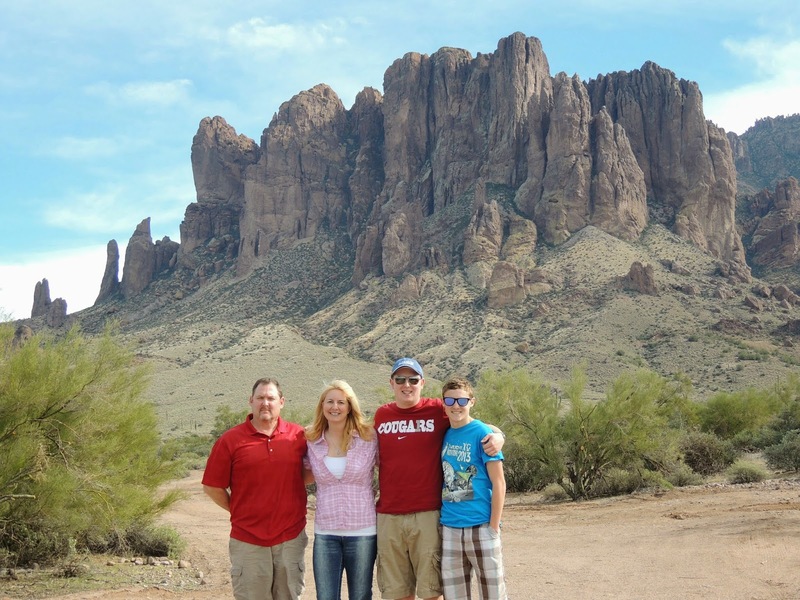 We stayed in Arizona for five days, and had a great time. We hung out by the lake, and the guys did tons of golfing. 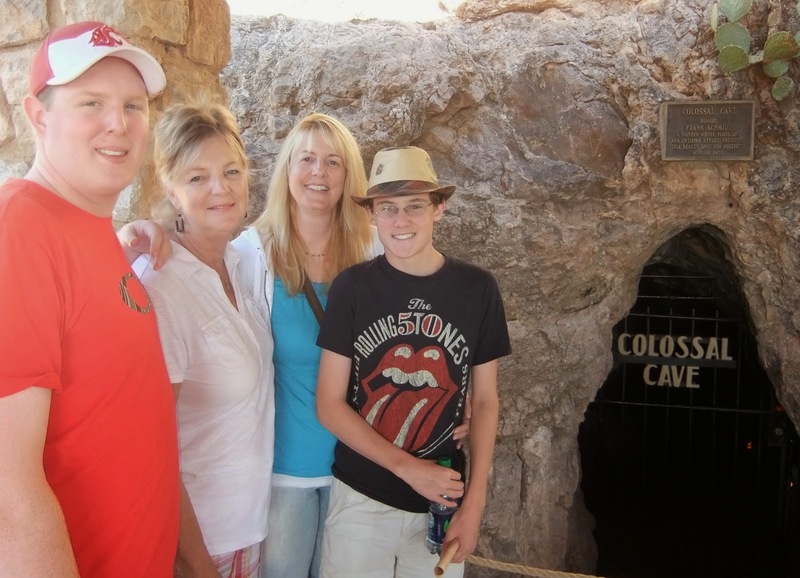 We drove to Tucson and visited Colossal Cave Mountain Park, where we toured the largest dry cavern in the world. It was so much fun, we decided to go back in 2013. Lots more golfing and fishing, and this time we visited Saguaro National Park and Tortilla Flat, an authentic old west town along the Historic Apache Trail. Earlier this year my hubby asked if we were going back for a third visit this Thanksgiving. I called my mom to run our plans by her. Guess what? They're driving over the river and through the woods to her father's house this year. Well fine. I'm not offended or anything :)! Except now I kind of like traveling on Thanksgiving. There's a built in four days off, so we only have to take two vacation days. We don't have a reason to stay here - my sister and brother have plans with their in-laws, and G's family is busy too. The boys wanted to go to Hawaii, but I almost had a heart attack when I priced airfare. So instead, guess where we're headed? If I can't have turkey with mom and dad, I guess Mickey will have to do! That's an amazing place! What a view. Looks like you and your teenagers had a great time. Blessings! Well I guess I was wrong when I guessed Mexico! California or Florida? I am assuming California since it is alot closer. I am going to my brother (20 minutes away). First time in 23 years I haven't helped mom or cooked myself. I am going to enjoy every minute of it! Hubby is whining about his leftovers so I have a surprise turkey dinner planned for Sunday so we can have left overs and stuffing (they don't make that and we HAVE to have it). I'm doing Christmas hopefully with two babies!!!! Have fun in the sun! It will be fun to go to your brother's house, and I'm really praying for you that the babies are home for Christmas - how fun will that be? We don't do anything the easy way - so we're actually heading to Florida. I've been so cold the last week, I can't wait! I would love to meet you next time we're in Arizona - probably Spring Break next year. What fun to travel for Thanksgiving break. Have fun at Disneyland (I'm assuming, since it's just a short plane right down, instead of across the country). You'll be so close to where I am! We thought about Disneyland, but I have so much family in the area, they'd be offended if we didn't visit all of them. So Florida it is! And Disney. Yay! We're going in March. I'm so excited! 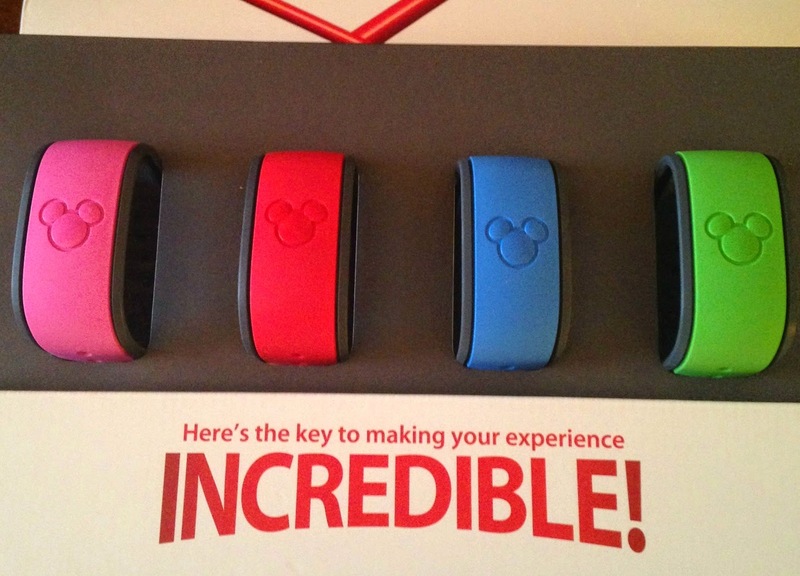 We haven't been to WDW since 2008 and I can't wait. Woohoo!! Disney World or Disneyland? I'm guessing land because you're west coast. And what a fun story. I'd love to spend Thanksgiving in Arizona. I'm so over the dreariness of New England in November. We are going to grandma's house this year, which quite literally is over the river and through the woods.. about 35 minutes away. And you could do that drive without seeing a single other car. Even during rush hour. Like I said, the woods. Have fun at Grandma's house! Even though we're in Seattle, I wanted to go to WDW again, so cross country it is! Alaska Air has a non stop flight that's not too bad. Sounds fun! I've always wanted to go around Christmas to see the decorations. Me too - I've been many times but never at Christmas time. What a blast! The one and only time I went there was over Christmas when I was 14. And I probably don't have to tell you how long ago that was! We had such a good time. I will always remember it! Have fun!!! Thanks Diane. I'm so excited, more than the boys I think! So excited for you for your trip. Hope you have an absolutely wonderful time! I didn't see it in my spam folder. Thanks for coming back :)! We're so excited!